In managerial accounting, operating leverage measures how changes in sales can affect net income. For a company with high operating leverage, a relatively small increase in sales can have a fairly significant impact on net income. Likewise, a relatively small decrease in sales for that same company will have a devastating effect on earnings. Operating leverage is typically driven by a company’s blend of fixed and variable costs. The larger the proportion of fixed costs to variable costs, the greater the operating leverage. For example, airlines are notorious for their high fixed costs. Airlines’ highest costs are typically depreciation, jet fuel, and labor — all costs that are fixed with respect to the number of passengers on each flight. Their most significant variable cost is probably just the cost of the airline food, which, couldn’t possibly be very much. Therefore, airlines have ridiculously high operating leverage and unspeakably low variable costs. A small drop in the number of passenger-miles can have a dreadful effect on an airline’s profitability. In a cost-volume-profit graph, operating leverage corresponds to the slope of the total costs line. The more horizontal the slope of this line, the greater the operating leverage. The figure compares the operating leverage for two different entities, Safe Co., which has lower operating leverage, and Risky Co., which has higher operating leverage. In this example, Risky Co. has higher fixed costs and lower variable costs per unit than Safe Co. Therefore Risky’s total cost line is more horizontal than Safe’s total cost line. 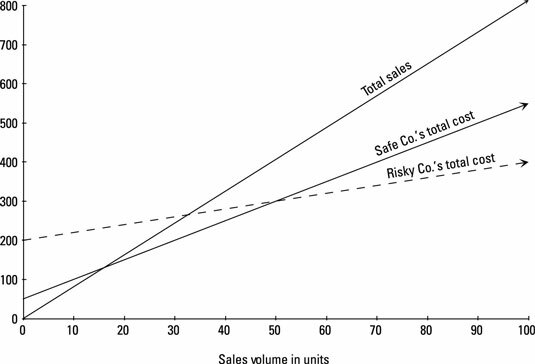 Accordingly, Risky has the potential to earn much higher income with the same sales volume than Safe does. Because its fixed costs are so high, Risky also has the potential to incur greater losses than Safe does. According to these measures, Risky Co. has twice the operating leverage of Safe Co. Although a 10-percent increase in sales boosts Safe Co.’s net income by 15 percent, a similar 10-percent increase in sales for Risky Co. increases that company’s net income by 30 percent! That said, high operating leverage can work against you. For Safe Co., a 10-percent decrease in sales cuts income by 15 percent; for Risky, a 10-percent decrease in sales reduces net income by 30 percent. Because automation replaces labor with machines, it usually replaces the variable costs (from direct labor) with fixed overhead (associated with running equipment). As such, automation tends to increase operating leverage. However, outsourcing usually has the opposite effect. Companies that close factories and pay other companies to make goods for them replace fixed costs (needed to run factories) with variable costs (used to pay other companies to make the goods).